BRIGHTON, Mich., Feb. 16, 2012 – We took the 2012 Ford Explorer out for a test drive around Brighton to check out its great features and show you first hand what the Explorer has to offer. One of the greatest features of the 2012 Explorer is SYNC with MyFord Touch. The elegant touch screen LCD display allows you switch between radio, CD, make a phone call, adjust the temperature, get a vehicle health report, and more. All of these features can be accessed by the SYNC voice command. On the driver’s side of the dash is the speedometer with dual LCD displays with steering wheel mounted controls, which allows the driver to switch between medias and make phone calls, as well as view fuel efficiencies and set GPS destinations. The adjustable traction management system allow you to select the type of terrain you will be driving on and your Explorer will adjust to keep you in control. The optional back-up camera displays your view when you’re in reverse on the MyFord Touch display. The guided lines will help keep you in a straight line while backing up and beeps if an object approaches or enters your flight path. The 2012 Explorer comes with a 3.5L Ti-VCT V6 engine that will get you about 25 MPG highway, or you can equip your Explorer with the 2.0L I-4 EcoBoost engine for enhanced fuel economy getting you about 28 MGP. 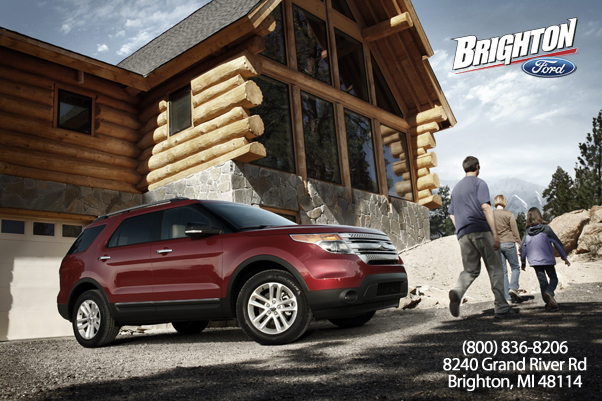 With 7 passenger seating, the Explorer is a great car for drivers that carpool or have large families. Don’t forget about everyone’s favorite feature… heated driver and passenger seats are perfect for those cold mornings! 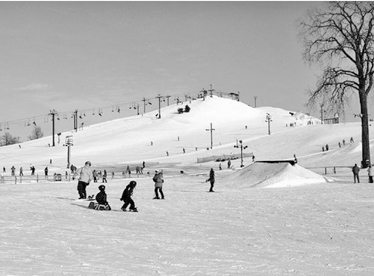 Need to haul snowboarding and ski equipment to Mt. Brighton for a fun day on the hill or a ton of materials from Rolison Pro Hardware to get your home improvement project done? With 80.7 cubic feet of cargo space and 5,000 lbs of towing capacity you’ll have no problem hauling everything you need! Two clicks on the key and the power liftgate magically rises open! Two more clicks and the liftgate shuts, perfect for when you have arms full of groceries and can’t quite reach up. We used the 2012 Explorer to get us to Mt. Brighton for a fun day on the slopes and it worked Great! Come into Brighton Ford and test-drive a 2012 Ford Explorer and experience all of these amazing features for yourself.